Have you ever loved your rented car so much that you would take any excuse to take a quick trip with it? As a visitor to Cape Town you might not know about all the beautiful drives you can take in and around the city, and that’s why we’ve put together a list of five best places to visit in Cape Town. Chapman’s Peak definitely makes the number one on the list of places to visit in Cape Town. This is one of the most gorgeous drives you can take in your life; the majestic Chapman’s Peak has 114 curves and overlooks the beautiful ocean and the town of Hout Bay. 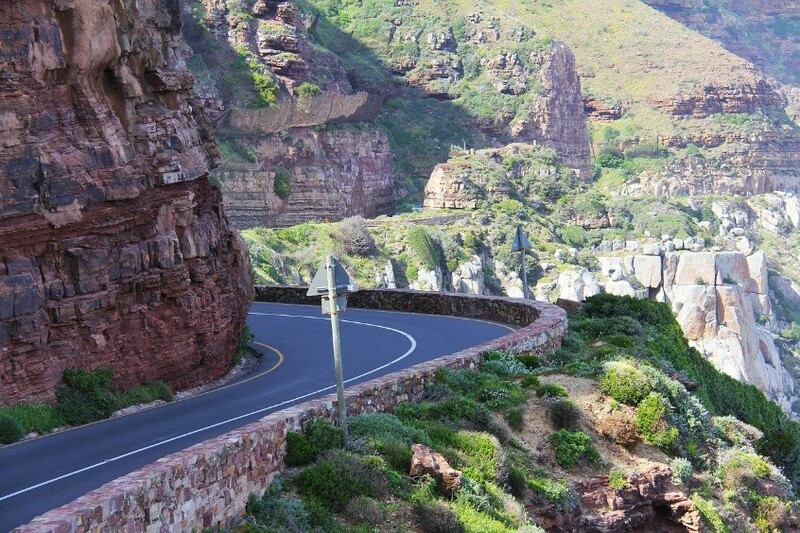 A fee of R40.00 will allow you to drive this wonderful stretch of road; the funds go towards maintaining Chapman’s Peak. It’s perhaps best to phone them to make sure that Chapman’s Peak is open since often it’s closed for maintenance. 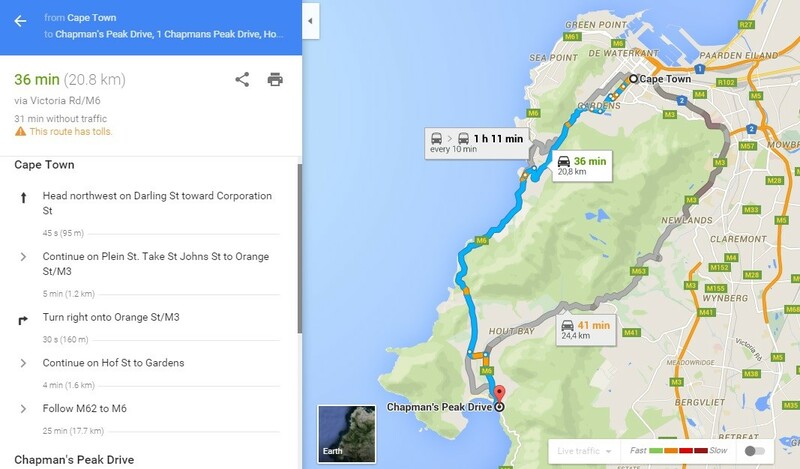 Caption: Directions from Cape Town city centre to Chapman’s Peak Drive. Second on our list of places to visit in Cape Town is of course the majestic table-top mountain known across the world – Table Mountain. Okay, so you can’t drive to the top of Table Mountain, but you can take the drive to the Table Mountain Aerial Way and enjoy a ride up the mountain in the cable car. 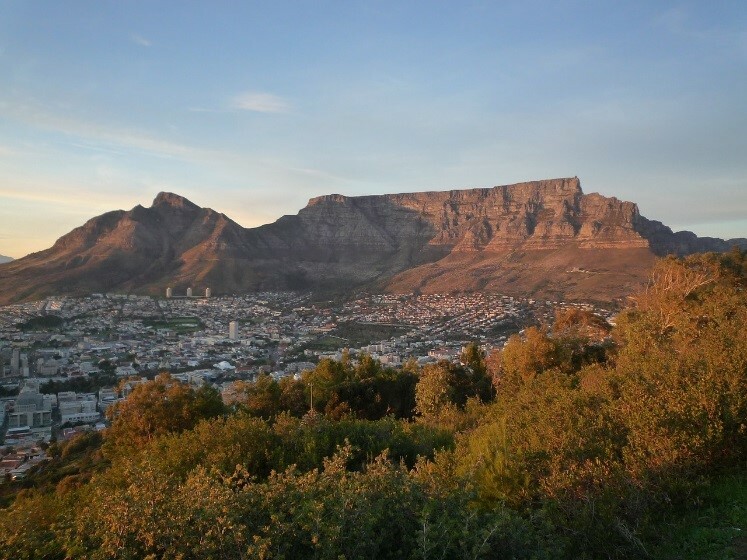 Don’t forget to take a drive to Signal Hill after your Table Mountain adventure. The first cable car travels up Table Mountain at 8am and the last car travels at 6:30pm. The last car to come down again is at 7:30pm. Ticket prices vary from R60.00 – R240.00. Best to check their website as ticket prices may change. Caption: Directions from Cape Town city centre to Table Mountain. 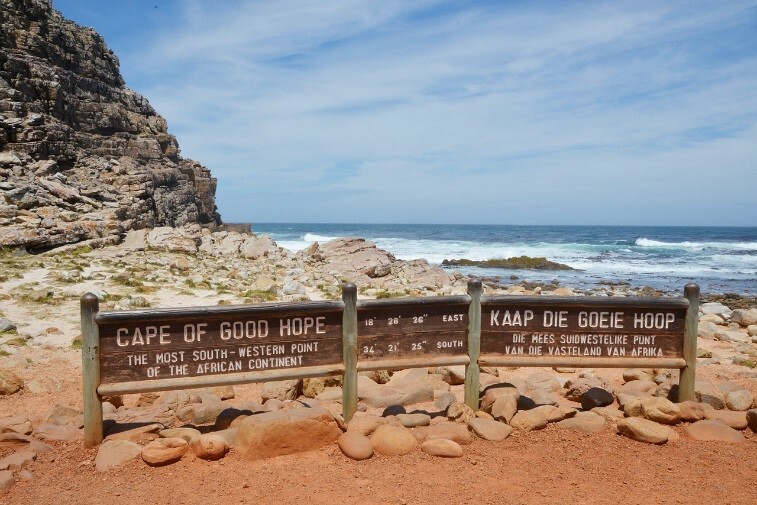 Third on our list is the beautiful Cape Point – the most south-western point of the African continent. Take a drive through Chapman’s Peak and once you’re at the other side continue on to the miraculous Cape Point and stare in wonder at the beautiful cliffs of this famous location in Cape Town. Cape Point is not only a beautiful place to visit, but is also history rich and full of educational information. You can also enjoy hikes, picnic and even fishing. Have a look at Cape Point’s official website for visitor-related information. Take note that an entry fee of R125 has to be paid in order to access the ‘Point’. 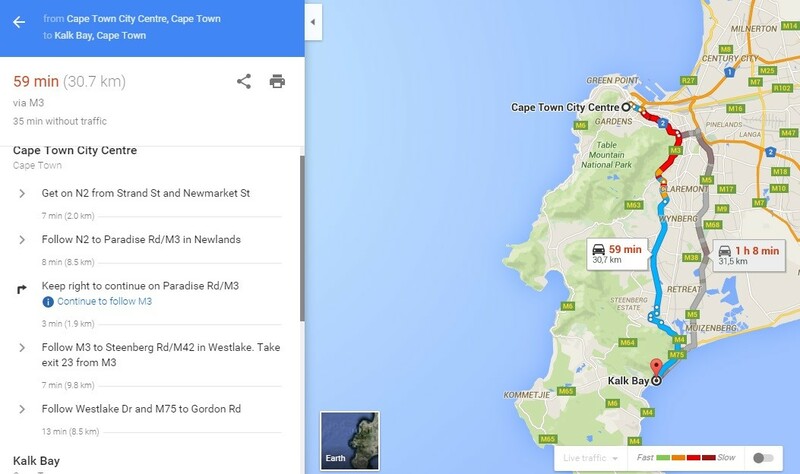 Caption: Directions from Cape Town city centre to Cape Point. 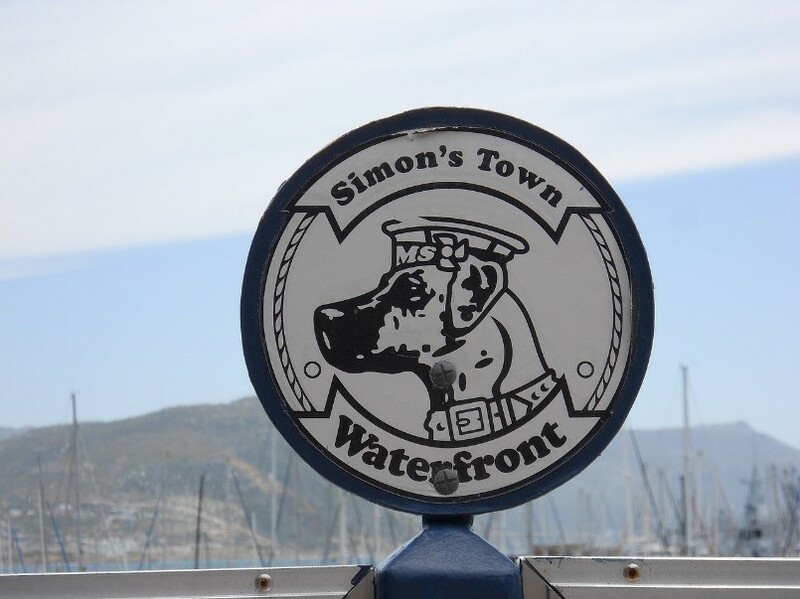 Our fourth chosen places to visit in Cape Town are the two fishing and naval towns – Kalk Bay and Simon’s Town. These two enchanting areas make for the perfect Sunday drive and will leave you, with no certain explanation, excited and content. Wonder around and enjoy the harbour, beaches, shops and restaurants. You can easily visit Kalk Bay and Simon’s Town by just continuing with your drive from Cape Point. 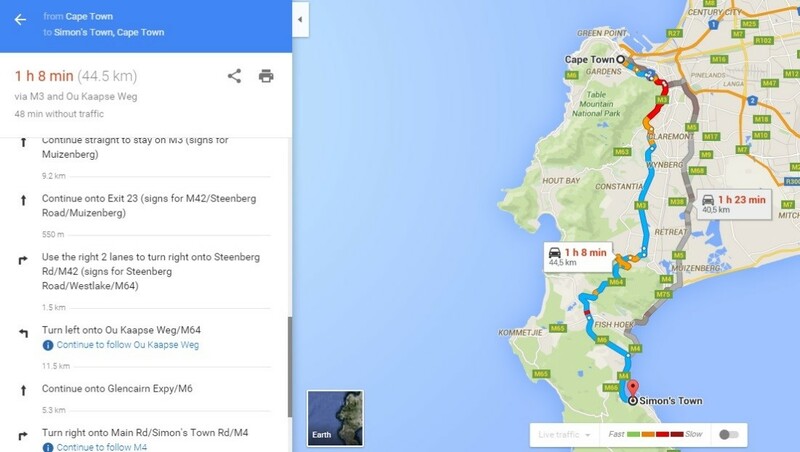 Caption: Directions from Cape Town city centre to Simon’s Town. 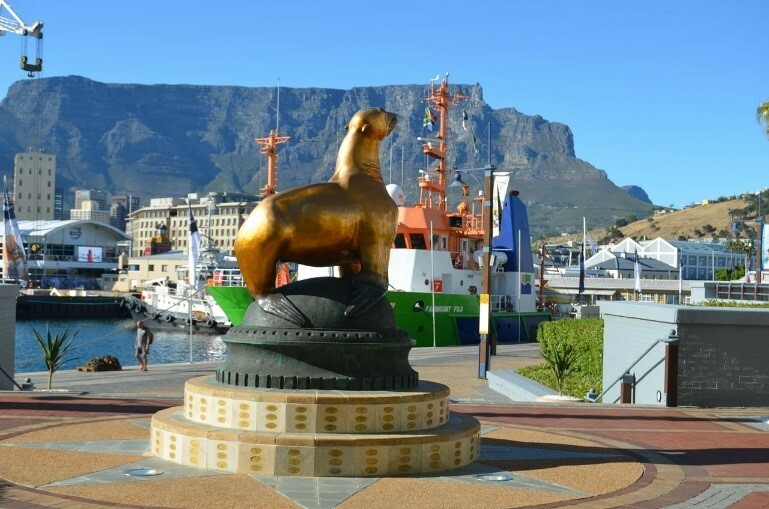 Lastly is the city’s number one shopping destination – the Victoria & Alfred Waterfront. Take a drive to the popular V&A Waterfront where you’ll find shops like Country Road, J Crew and Diesel. Here you can also wine and dine at some of the best harbour-facing restaurants in the Cape (perhaps even the best in the country). The V&A Waterfront is a short drive from the city, but promises hours of entertainment. 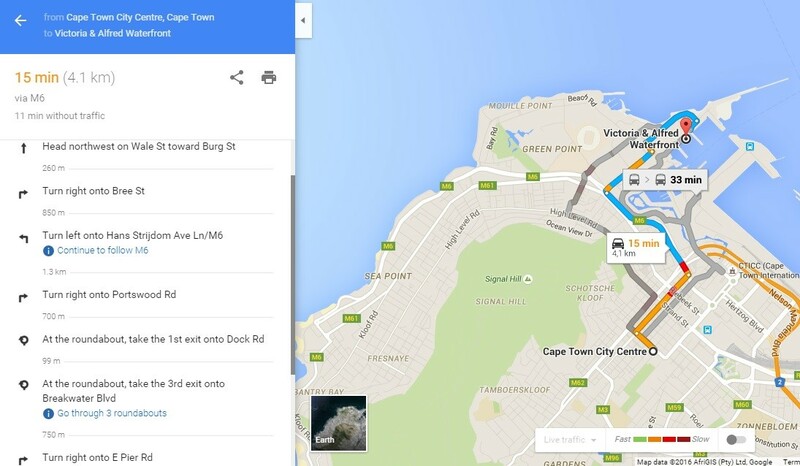 Caption: Directions from Cape Town city centre to the V&A Waterfront. Cape Town has plenty more to offer the adventurous traveller and it is recommended you stay for at least two weeks. If you’re looking for other activities to do in the Mother City, check out our list of tourist attractions in Cape Town.